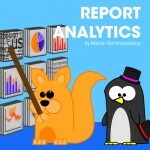 Report Analytics scrapes data from existing reports into integrated reports for decision-makers. It is positioned as self-service business intelligence that eliminates the delays and costs of traditional data warehousing. However, I have a concern with the trustworthiness of the existing report data.